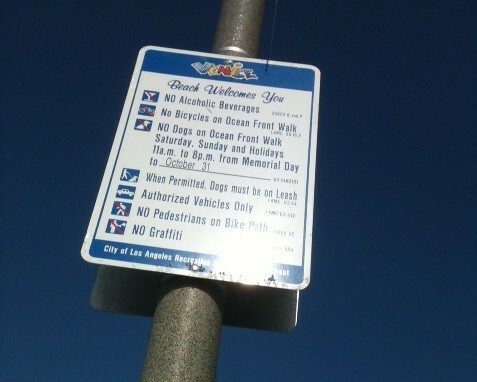 Dog Laws at Venice Beach - Yo! Venice! 1. “No Dogs on Ocean Front Walk Saturday, Sunday and Holidays 11am to 8pm from Memorial Day to October 31st”. 2. “When Permitted, Dogs must be on Leash”. Venice Beach is a park. Dogs are allowed in designated areas only. To read all of the specifics of Sec. 63.44.: Regulations Affecting Park and Recreation Areas, click here and download the pdf with the long form of the rules. Ocean Front Walk does allow Dogs, as worded on the signs on Ocean Front Walk. The grass areas and sand between Ocean Front Walk and the Pacific ocean have not been designated as dog parks, so you can get a ticket for having your dogs there, but it is not usually enforced. If you would like to run your dog off leash, use the Venice – Westminster Dog Park at 1234 Pacific Ave. It is properly fenced in and open from 6 am – 10 pm. Links, numbers and information is believed to be valid as of 2-2012. No warranty as to their validity is given by YoVenice. Google things for more information.